Murdie MacKinnon was left disappointed as his Pollok side crashed out of the Ardagh Group West of Scotland Cup Second Round last week as Troon knocked them out on penalties after a 1-1 draw at Portland Park. Half way through the first half, Byran Young was played in by Stefan McCluskey’s ball from the left hand side, his goal bound shot from the edge of the area was heroically headed off the line by Lewis Clark. With ten minutes of the first half remaining, Stefan McCluskey was again played through by a ball over the top from Ryan McGregor he rounded Scott Johnstone but could only find the side netting meaning Troon went into the break 1-0. With 20 minutes to go Ryan Stevenson saw his shot from 25 yards fly wide of the goal after a great counter attack from the home side. With seven minutes of normal time remaining Pollok drew level. The lively Stefan McCluskey and substitute Adam Forde combined at the edge of the Troon box with a neat one two, McCluskey found the space on the right hand side, he opened up his body and fired across Johnstone into the far corner from the angle. 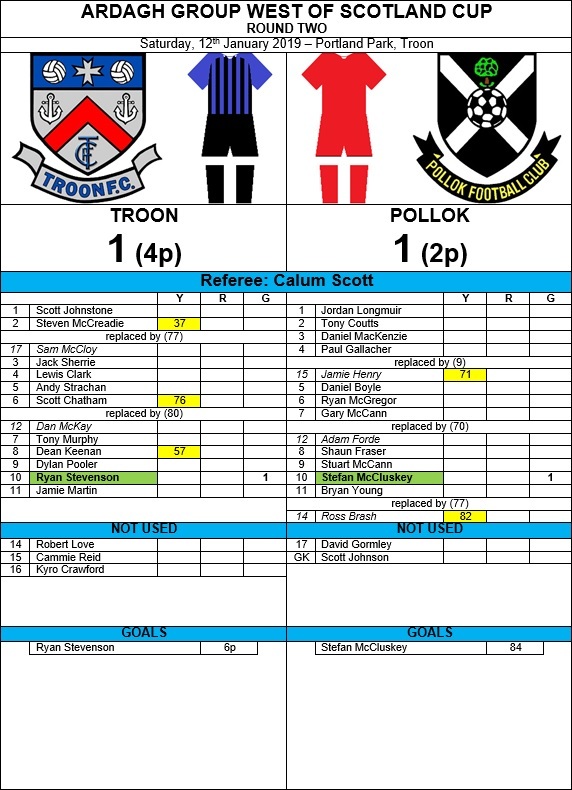 With the match level after 90 minutes Scott Johnstone stepped up and saved Troon in the penalty shootout. Saving Jamie Henry’s well hit spot kick headed for the bottom left corner and unnerving Stefan McCluskey who could only smack the upright. This left Dan Mckay, Ryan Stevenson, captain Dean Keenan and Dylan Pooler to send Troon through to the next round.